Venice: The American View, 1860-1920, Fine Arts Museums of San Francisco, 1984. John Singer Sargent, Whitney Museum, New York, 1986. Venice: From a State to a Myth, Fondazione Giorgio Cini, Venice, 1997, no. 102. The Poetry of Light: Venetian Drawings from the National Gallery of Art, National Gallery of Art, Washington, 2006, repro., back cover of catalogue. The Poetry of Light - La poesia della luce: Venetian Drawings from the National Gallery of Art, Museo Correr, Venice, Venice, 2014 - 2015, no. 141. Lovell, Margaretta M., VENICE: THE AMERICAN VIEW 1860-1920, Fine Arts Museums of SF, 1984: 109-110, no.62. Adelson, Warren, et. al. Sargent Abroad: Figures and Landscapes. New York, London, Paris, 1997: 199, no. 201. Venice: From a State to a Myth. Exh. cat. San Giorgio Maggiore, Venice, 1997: 272, 386-387, no. 102. Little, Carl. 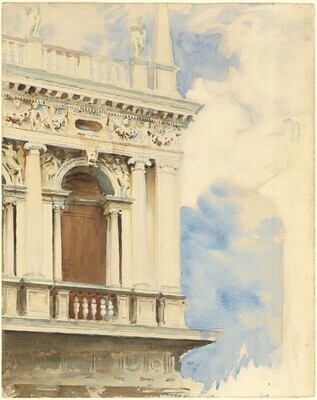 The Watercolors of John Singer Sargent. Berkeley, 1998: repro. 47. Ormond, Richard, and Elaine Kilmurray. John Singer Sargent: Venetian Figures and Landscapes, 1893-1913. The Complete Paintings, Volume VI. New Haven and London, 2009: 199, 248, no. 1143, repro.